We love a party. My cousin Allie married in Jamaica and had her wedding reception here. So with a tropical theme in mind, Lenny and I wore clothes we had worn in Hawaii a few years ago. There were several others with the same idea, lots of sundresses and a few other men's flowery shirts. 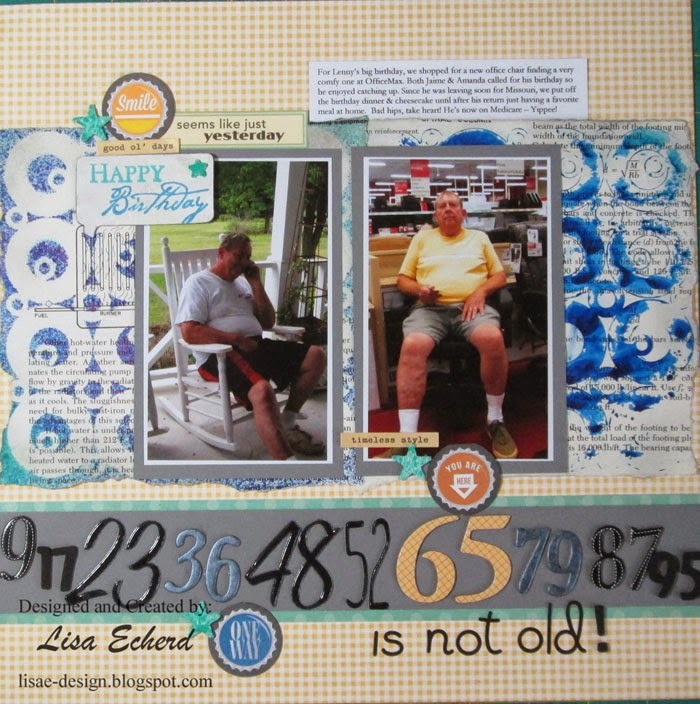 So for this two page layout, I chose Stampin' Up! 's Sweet Sorbet papers from the past winter's Sale-a-bration. 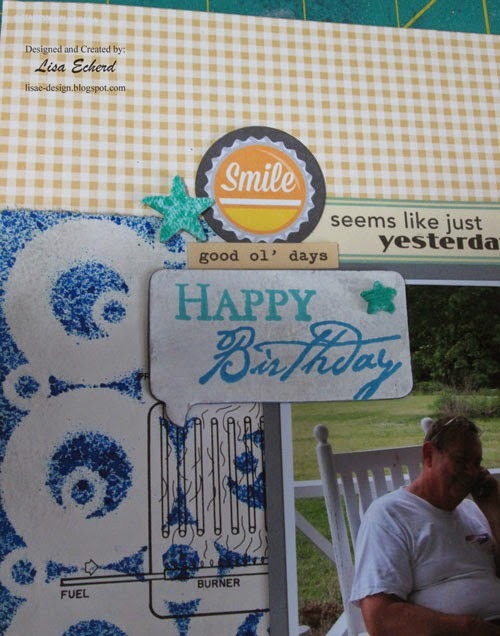 It is my favorite paper ever from Stampin' Up! 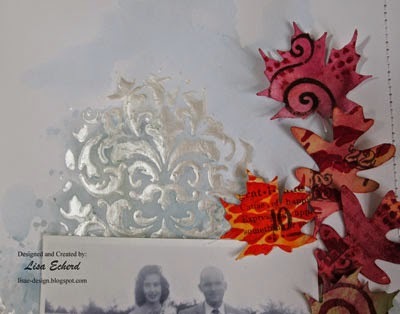 On the far right of the layout, I stenciled a border of leaves from a stencil I cut on the Silhouette. 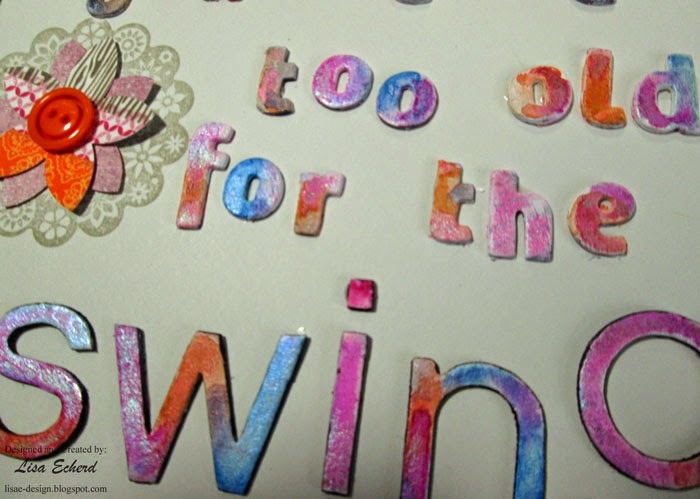 I'll have a lesson on creating your own stencils in my upcoming Scrapbooking with Stencils class. 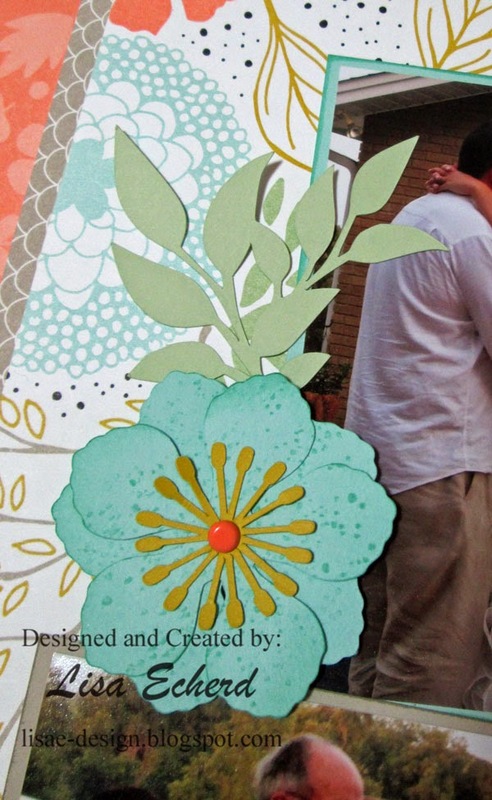 You can cut them on the Silhouette or the Cricut or any other electronic die cutting system. The leaves are done in light modeling paste colored with an ink refill. I love all the dimension and texture. One of the nice things about cutting your own stencil is you have the design to cut out from paper as well. I cut a smaller version of the leaves to go with the flower on the left hand page. 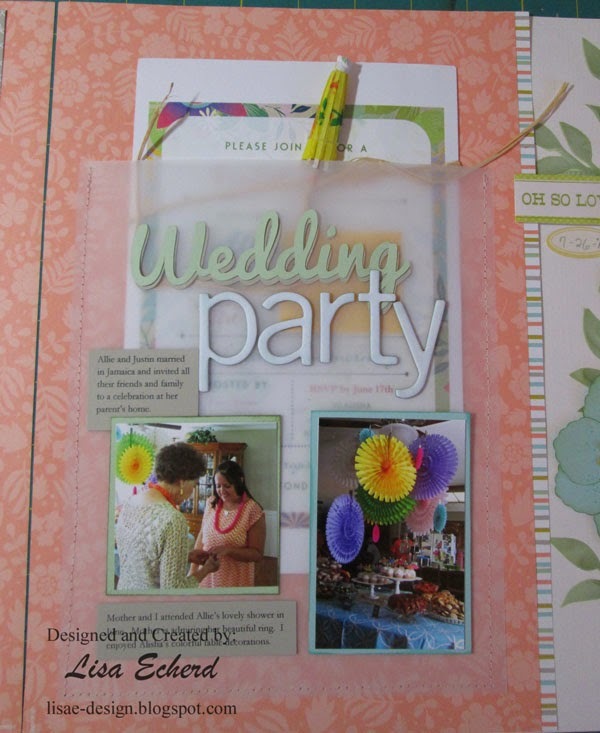 The page also has a vellum pocket to hold the shower and wedding invitations. Labor Day holiday weekend is here in the US. Hope you have safe travels and one last blast for summer! at girls who wear glasses? I hope so. At least one man, anyway. I have actually worn glasses since I was 16. I had to get them to get my driver's license. When I was 18, my high school graduation gift from my parents was contacts. I then found out that I really only had one eye with poor vision. So I wear one contact. When I take that contact out, the other eye takes over and I seldom wear my glasses. Every year, the doctor tells me how I'm going to love my eyes when I get to a certain age. Turns out, I'm supposed to wear one contact for close up and one for distance as I have monovision eyes. I'm not quite there yet. 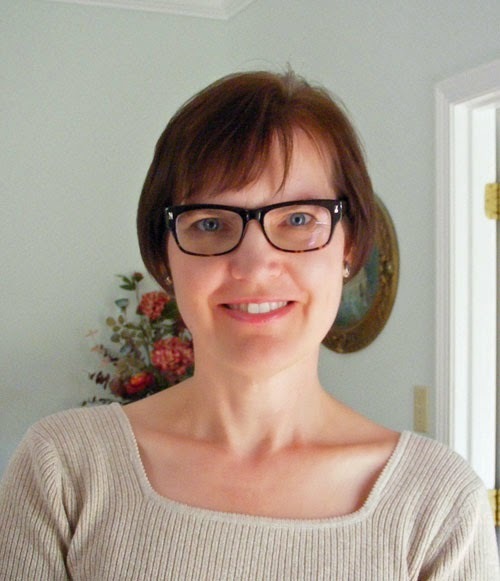 My prescription hasn't changed so I hadn't bought new glasses in 15 years. Since I seldom wear glasses, I really balked at the idea of spending $200, $300, or more for something I use a few hours a month. So I tried an on-line site - coastal.com. I had a really good experience. 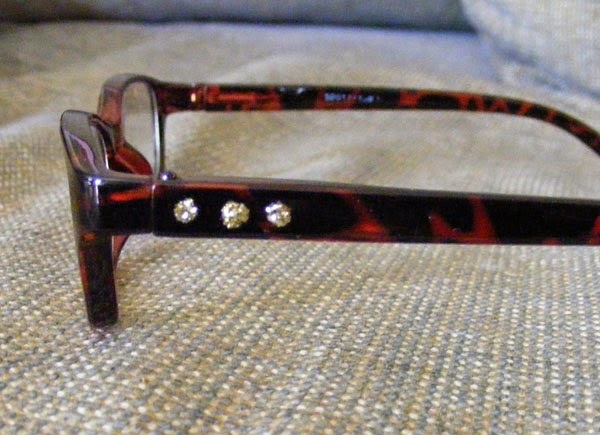 Guess what these prescription glasses cost? $39, that's right, just $39. I shopped the $49 frames, used a $10 off coupon and got free lenses since they are single vision. I should have gotten ones with just a bit wider bridge over the nose for appearance sake but I can see beautifully from them. I'd definitely go this route again. These aren't the only new glasses around here these days. This pair are my first readers. Eventually I'll do the monovision eye thing but for now I need the lowest power of readers possible. I didn't let myself suffer from short arm disease and I don't wear them much but I do need them for a few things. My opthamologist suggested the lowest power possible which proved to be a challenge in my small town. I had to go to 4 stores in two towns to find a +1 power. They aren't very girly either. Which brings us to a new challenge in our household. One person with a +1 and another with stronger power glasses, you get some funny stories. The other day, ironically, I was taking both of my parents to the opthamalogist at the same time. I looked for my book and glasses to take along. There was the book where I left it but no glasses. I searched everywhere and couldn't find them. My DH was off on a service call so I couldn't ask him if he had seen them. Later that evening he was in the kitchen and I walked in asking if he had seen my glasses. "No, I have no idea." I looked up at him then and asked again, "Are you sure you haven't seen my glasses?" "No." He was completely baffled. I picked up a dinner plate and held it up as a mirror. "Are you sure?" He had the glasses on. "Well, that explains it," he said. "That's why I had such a hard time seeing those screws I was trying to put in. I thought my eyes were worse and I was going to have to go up on my power." Well, he can still see fine with HIS glasses. But he keeps reaching for my less than girly glasses anyway. So that is why I decked them out with some Stickles. So the scrapbooking supplies help out again! Thanks for stopping by! 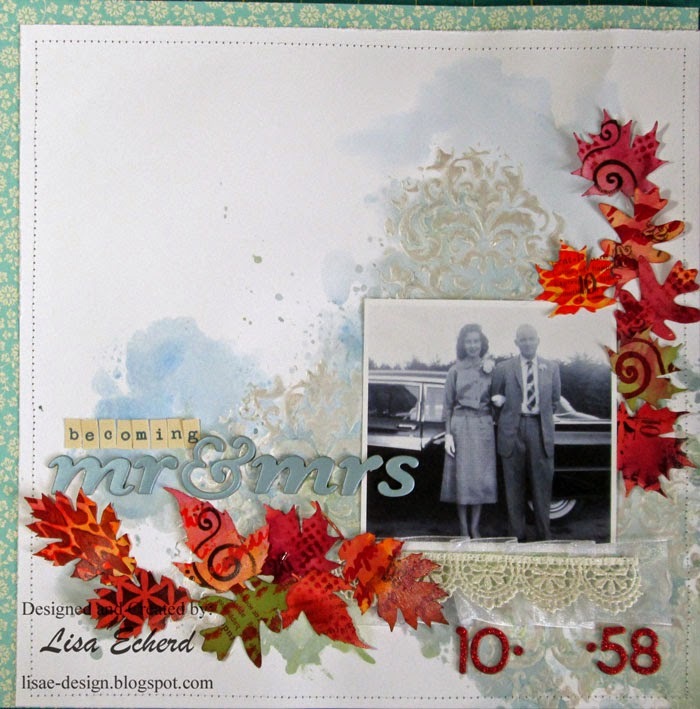 Those leaves in my newsletter video found a home on this heritage page. The page features the only photo of my parents on their wedding day. They were married in the fall of the year. 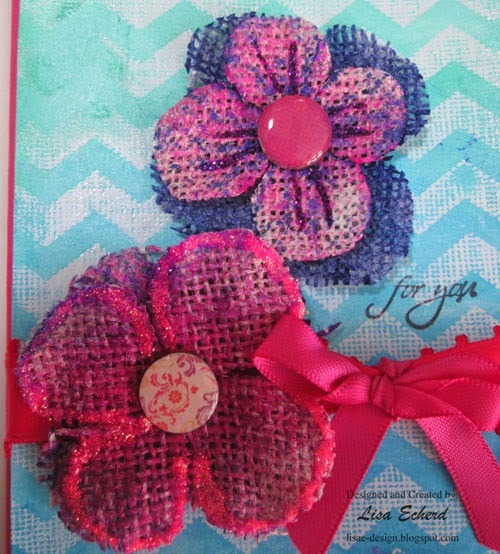 For the background I wanted an elegant, soft look so I turned to the Damask stencil from Prima. 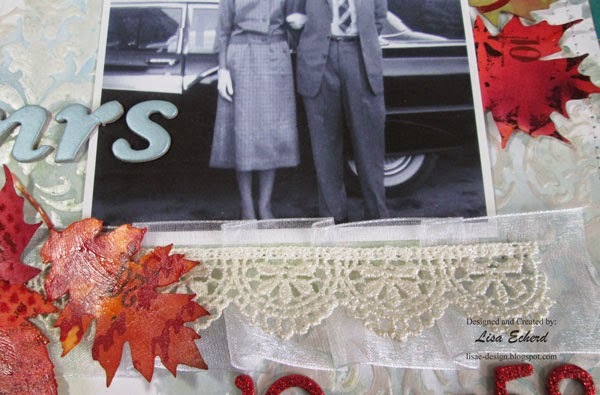 I covered it in white metallic craft paint which is one of the best deals in crafting. It is cheap and oh so gorgeous. Working with stencils has become a passion. 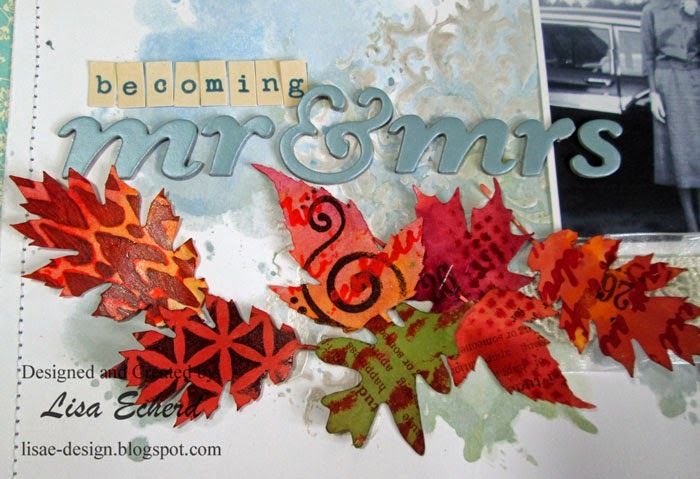 In September, I'll have my latest class - Scrapbooking with Stencils available. So stay tuned for more about that in a few days. For color on this page, I'm continuing in the quest to use my supplies this summer. This time it is craft ink refills. You could use most any type of ink refill for this resist technique or use gelatos, watercolors or regular ink pads. I like how splotchy and drippy the effect is. Also continuing on using up some Thicker packs. For this title, we have consonants only. To see the leaves, be sure to subscribe to the newsletter. I'll send the August newsletter out to new subscribers at the end of the month. Can you believe it is almost time to send children and teachers back to school? School starts here next week and although my husband and I no longer have his daughters to get back in school, this yearly milestone still affects us and brings up memories. Also, fall is just around the corner. 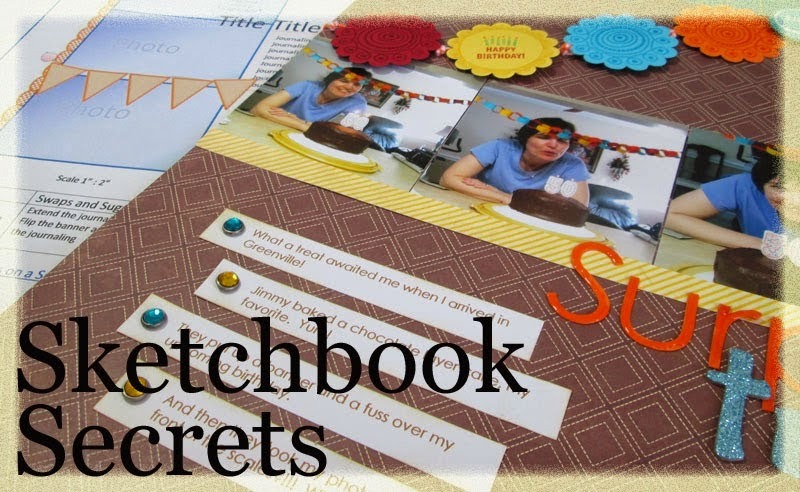 So with those things in mind, I have some special ideas and a video for you in my free monthly newsletter for August. I'll be sending it out on Wednesday or Thursday with one resend at the end of the month for new subscribers. 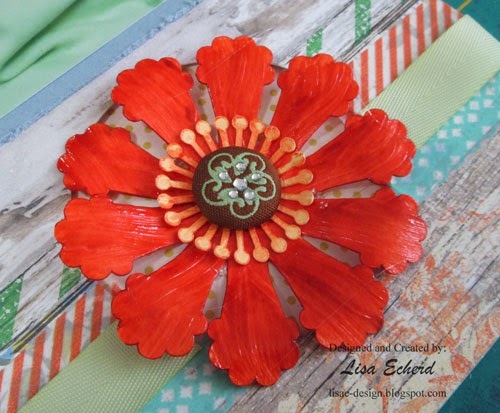 The newsletter also shares a sneak peek at my next class! Be sure to sign up on the sidebar! Almost everyone in my family has a BIG birthday this year. We celebrated Lenny's birthday over several weeks in June and July because he visited his family for several weeks, too. The photos here are from right around his birthday when he was chatting with family on the phone and when we went chair shopping. His gift was a new office chair. He spends a lot of time in there and he seems to really like the new chair. I highlighted the birthday in the border of various ages in Thickers. You could do the same thing in stickers if you had some you wanted to use up. There is nothing special about the ages in black and dark gray. They are just random numbers I wanted to use up. 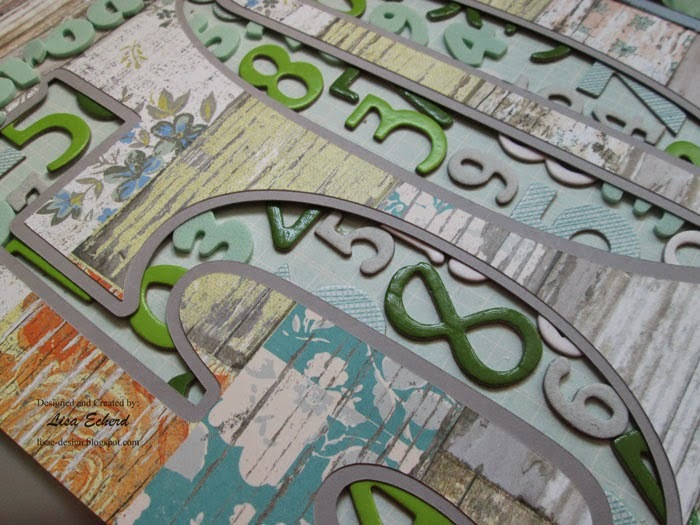 My next class is on using Stencils! The class will be available in September and I think you are going to love it. So stay tuned, more details will be coming along soon. Thanks for watching! The August newsletter will be out next week. 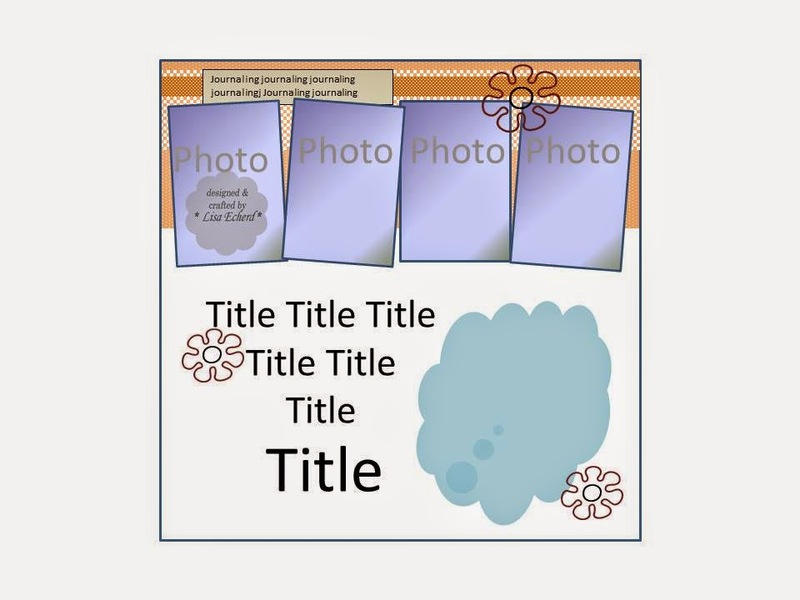 In marketing, they say that customers have to see, hear or read something at least 3 times before they retain it. Apparently, I have to see things several times before a light bulb goes off that says "oh, hot trend!" 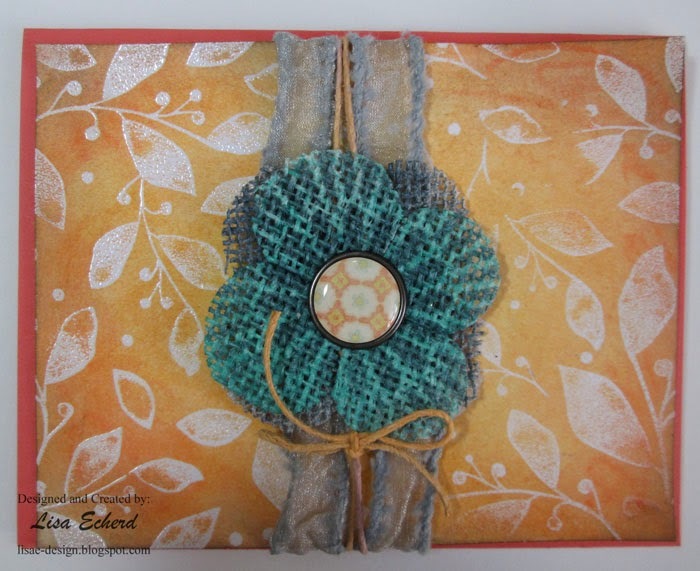 I've been seeing burlap in the craft stores in various places and it wasn't until I was browsing an on-line scrapbooking store for flowers that it really hit me - burlap is hot. Whether something is a hot trend really doesn't matter. What matters is whether you like it. Do I like burlap? I can take it or leave it. I do like a change sometimes and the texture is interesting. So finally my consciousness was sufficiently awakened to this trend when I spied a burlap hydrangea in the floral department at Hobby Lobby the other day. It was probably more because I love hydrangeas than anything. 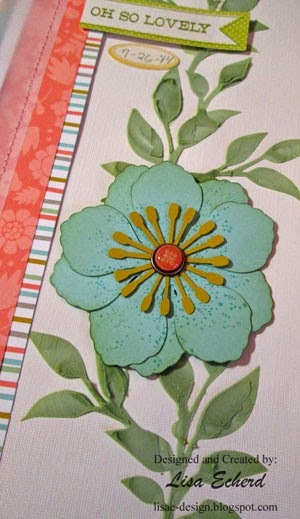 For these cards, I pulled the petals of the hydrangea and did a bit of coloring mostly with spray mists. Toward the end of the video below, I tried gelatos on them and I have to admit. They work better. Both do a good job of recoloring the burlap but the gelatos are permanent. So when you go over them with other mists or Stickles, the color doesn't bleed. Mists reactivate when mixed with another water based product which is why my flowers have a pink/purple Stickle border. I actually used clear stickles on them and the Stickles reactivated the pink Dylusions mists and voila, pink Stickles! Either way is a fun effect. It is just whatever you are looking for. I'm still mostly working through my stash this summer but it was fun to try something completely different. I'm not sure I'd ever done anything with burlap before and I thought I'd tried every type of fabric possible. If you aren't already, sign up for my free newsletter on the sidebar. August will be sent soon. I titled the video that went with this page - Covering Ugly Thickers. I know some people will argue there is no such thing as an ugly Thicker. But there are certainly a few packs that have crept into my collection I don't like. The small ones used for this layout were part of a grab bag. I got lots of useful sets and a couple that haven't ever been used. These started out as a pink and black tiger stripe. It is a look that is early-Madonna, to me. A coat of gesso and some watercolors and they are still an usual color but they match my photos. The shine is from Twinkling H2O's. These are pretty but probably not a product I would buy again. I've found my basic Hobby Lobby watercolor set a good value but I don't use them enough to invest in individual colors. I'm happy to have put another product in my stash to use this summer. The photos were taken this past winter when I jumped on the swings at the playground one day just for fun. 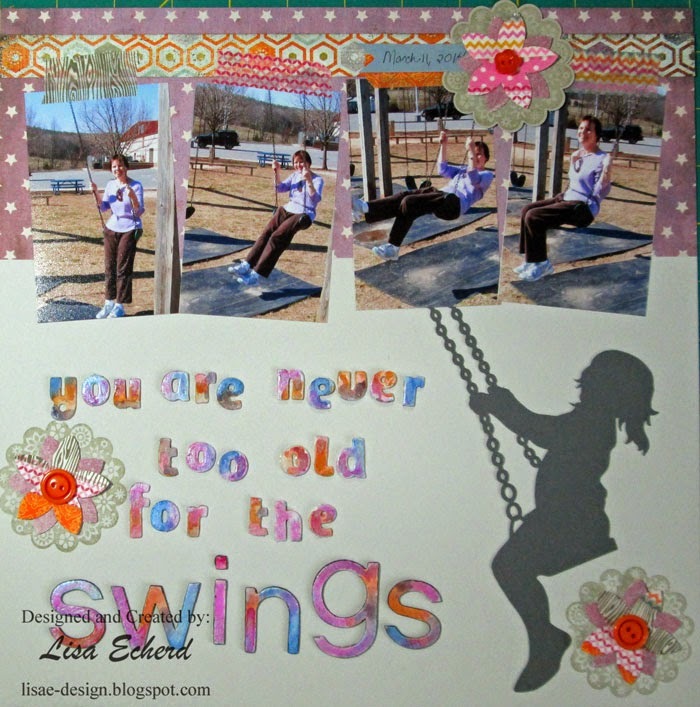 I've always loved the swings and as sturdy they are someone must expect a few other 'big kids' to swing. The die cut is from the Silhouette store. I used a bit of my Washi stash on this one as well. So here's to all the fun things we get to do as little and big kids! Hope you have some fun in your day. DH and I were on our walk this morning and as often happens, a little ache or pain made us remember our ages. We aren't old but then 'old' is a moving target. I asked him, "Didn't you think 50 was old when you were 30?" "Of course!" he responded. Well, I did, too. But those last 20 years have just sailed by. So with that in mind, 5 years isn't so long at all. I'm leading up to the idea of keeping a 5 year journal because at first that seems like a big commitment. I started one in January of 2013 and it has become a daily habit I enjoy. A 5 year journal is making a short journal entry each day every day for 5 years. Why? So you can see how you have changed, or how you haven't changed. There are questions for each month - different ones for each day so you answer a different question every day for a year. Then the next year you just start over answering the same question on the same day of the year. It's already interesting to see how things have changed - or not. What are you glad you did today? 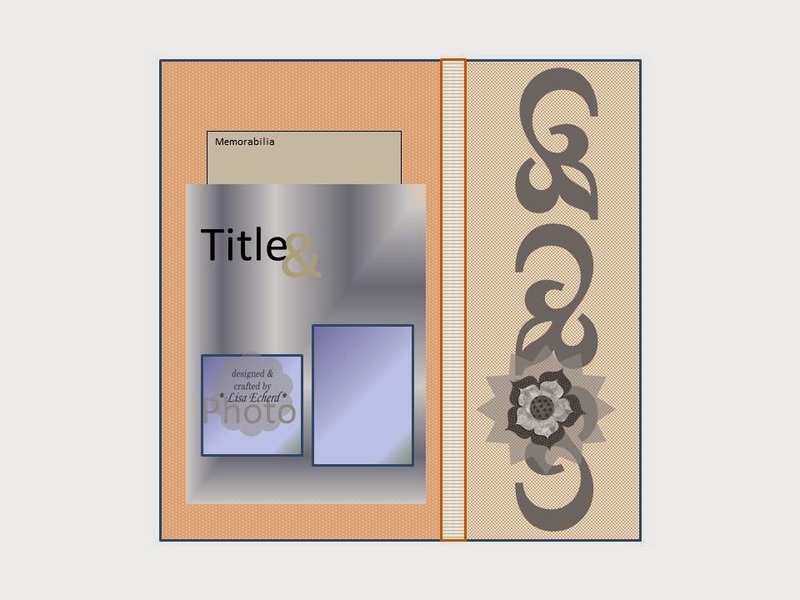 2014 the idea of getting a embossing machine – again. This is probably the 3rd time I’ve planned to buy one and backed out because it isn’t a tool that takes me in the direction I want to go. Sometimes my answer is just one word. Now I keep meaning to bring up this topic at the beginning of a month and I forget. So I finally decided to just post about it anyway. You really can start at any time of the year. I use Word documents - one per month to keep my questions and answers. I just downloaded her PDF's and then cut and pasted the questions right into Word. Very simple. You can write your answers in a regular journal, use index cards, all kinds of ways. 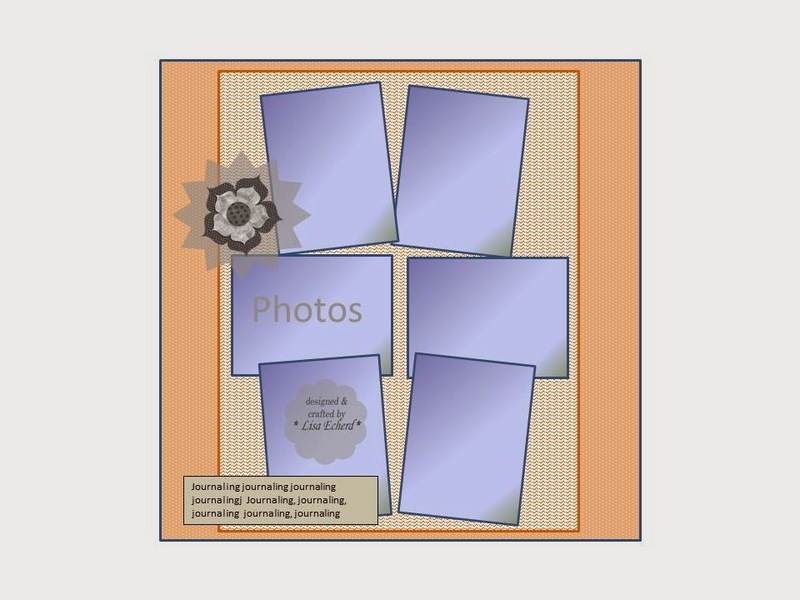 I think these are going to make some great scrapbooking prompts down the line. I may not even wait 5 years on some of them. It's fun and kind of a relaxing way to end the day. I almost never use the numbers in my Thickers and sticker sheets. So for this layout, I set about using up numbers from green, white and aqua sets to match my background paper and since green is my favorite color. 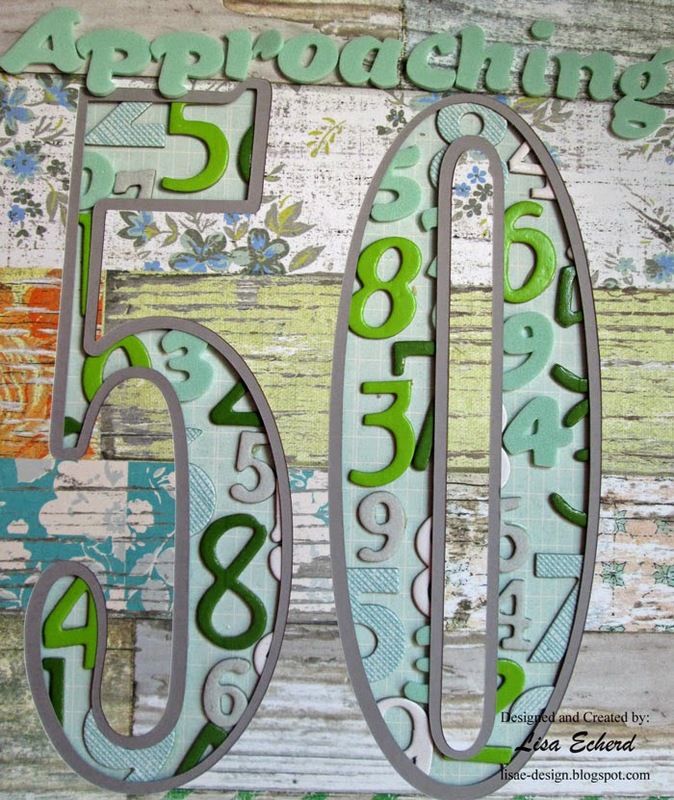 The '50' is cut with the Silhouette. After working on it a bit, I realized I needed an inside border. On the Silhouette, this is called an Internal Offset. 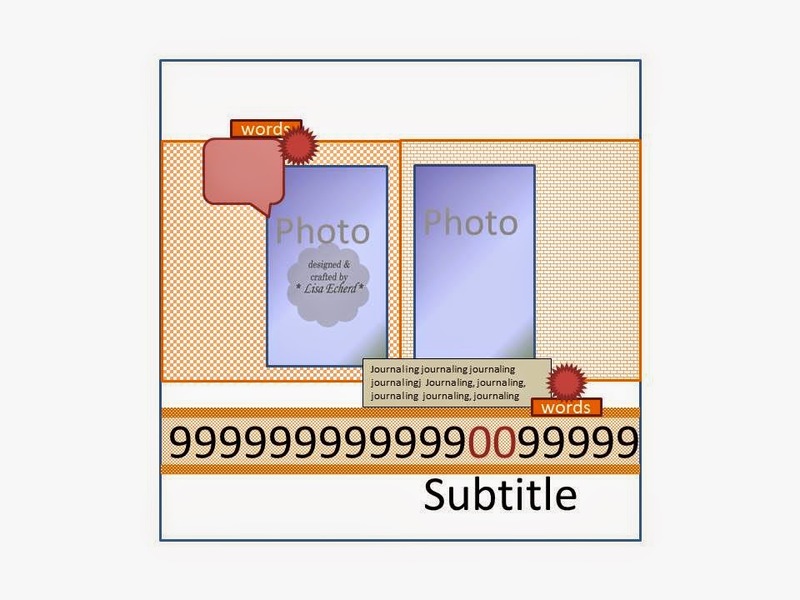 The video shows the process. 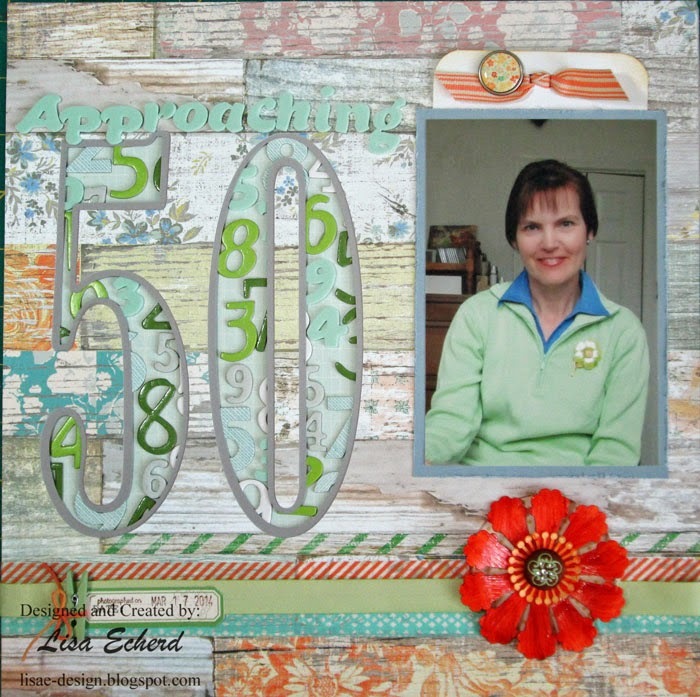 The idea for this was inspired by the card I CASEd in yesterday's post from Cheiron Brandon. Here is her card. 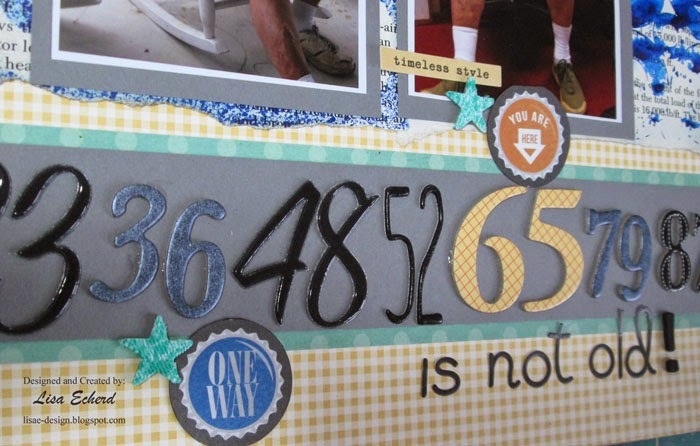 She has Washi behind her numbers and I used the Thickers. I worked through quite a bit of stash on this one, too. The background paper is from Studio Calico. I love their papers but seldom buy them because I just can't quite make them work for me. This was the only one I've bought this year and wanted to save it for something special. 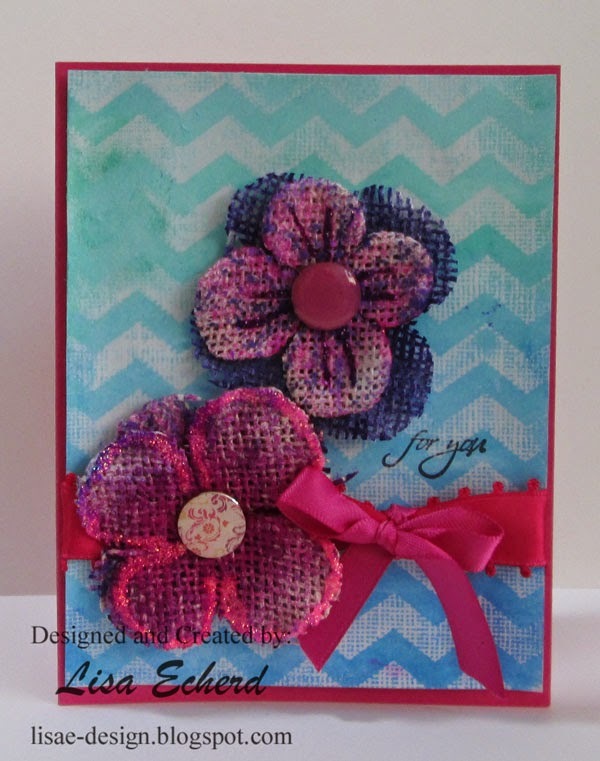 There are two discontinued Stampin' Up! cardstocks on the page as well as some very old chipboard from Oriental Trading. I'm really using the part that normally gets tossed so that felt good to put it to use. My favorite part is the flower. I had one already cut with the Silhouette. It was one of my test cuts when I first go the machine and had never done anything with it. I could have cut another from a matching paper but my computer was back downstairs by that time so I had some fun altering it with glaze and ink. 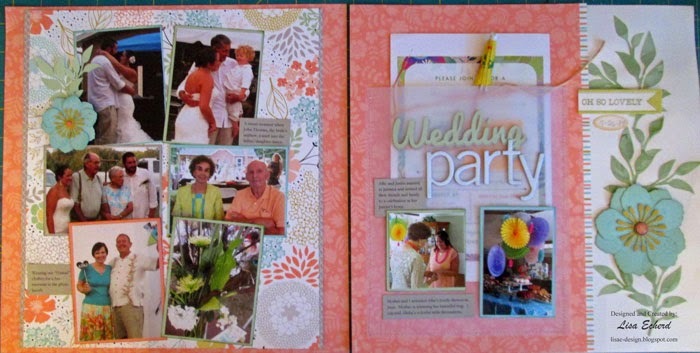 I love this using up the Thickers idea this month as I'm really enjoying my pages. If you aren't a Thickers collector, you can do the same thing with stickers.